THERE can be few moments more satisfying for the gardener than the first pickings of the year. 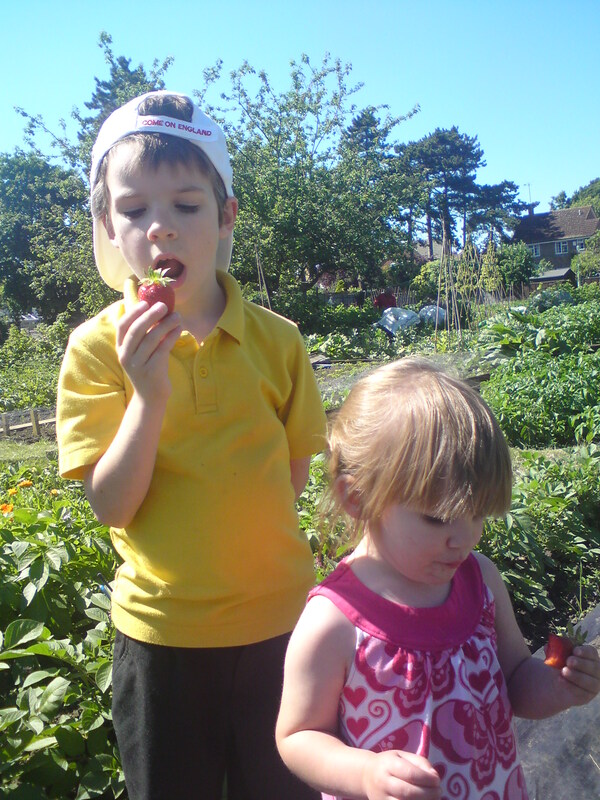 This week we’ve started eating the fruits (and vegetables) of our labours as the broad beans, first garlic, peas, early spuds and strawberries were ready for picking. The strawberries barely make it off the plants before the kids are scoffing their faces with them. I’m not sure a single fat red berry has ever made it home. A home-grown strawberry is irresistibly tasty. Baby Bonnie has worked out exactly where the strawbs are on the allotment and scurries off up the path to get first dibs on them. She’s usually trying to force her way under the netting before I’ve even untangled the fixings and pegs. She just loves strawberries. I’m dreading when the crop stops coming. Hopefully we’ll have currants and gooseberries ready by then. The battle with the weeds goes on, but at least I’ve got my leeks and sweetcorn in the ground, and I’ve planted out three courgette plants too. Leeks are easy to grow from seed, and if you were too late you could check out the garden centres for strips of ready-grow leeklets, they may even be reduced. You make a wide, deep hole (I push the handle end of a hoe in to make mine) and simply drop your tiny leek into it, without backfilling with soil. Just water each leek’s planting hole once they’re all in and leave them to it. They won’t be ready until next winter so the hole allows the stem to swell and stay blanched. I don’t know about you but my onions are looking pretty fat and ready, although the leaves haven’t dried and drooped yet, the sign I usually look for. My onions were a disaster last year. Hopefully the combination of heavy rain and blazing sun has helped them on the home straight. One disappointment: my little apple tree. Successfully moved from home to allotment due to football damage, it had looked like it was enjoying its new position, in full sun with lots of space. But having blossomed well it has now dropped every one of it’s little fruitlets, so I guess there won’t be apples this autumn again. Not sure what I did wrong. Very envious of fellow allotmenteers who have lots of fruit from relatively young trees. Maybe it will third year lucky. I might have been doing this gardening lark a few years now, but sometimes I just feel like an absolute beginner.